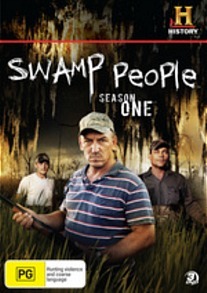 Swamp People DVD Review It’s adventure television done right. My stomach’s rumblin’ for some deep fried ‘gator, Cajun style. Welcome to the swamp. They’re the words that greet you at the start of every episode, heralding in another adventure in the Louisiana Bayou. Swamp People takes place in the Atchafalaya swamp, a sprawling expanse of canals, ponds and bays that is home to some dangerous critters: Gar fish, cottonmouth snakes, and of course alligators- lots and lots of alligators. This History Channel series documents the 30-day period of the year when humans are legally allowed to hunt the apex predator of the swamp. ‘Gatorin’ is a dangerous, hard, dirty job, and it takes a resilient kind of soul to go out every day and haul the reptiles in. But there’s no shortage of toughness out here. During the first few episodes you’ll be introduced to the characters who make their living this way: Junior and Willie, the father-and-son team; Troy the good-natured hunter who doesn’t mind telling a tall tale; Bruce and Mike, who go it alone; Joe and Tommy, the super-competitive pair who regularly bite off more than they can chew. The subject matter provides ample fodder for an exciting, fast-moving series. Every time the hunters try to pull an enraged ‘gator close enough to their boat to get a shot in, you expect something to go wrong. It often does. It’s very much a show about primal instincts- the fight for survival, man against reptile, tooth, claw and cunning against muscle, ingenuity and lead. All of the monster ‘gators are given individual nicknames based on their traits: Bighead, Godzilla, Loch Ness, Houdini. As well as the frightening and dramatic, Swamp People also has its funnier moments, such as when Junior reluctantly allows an Italian fashion designer onto his boat during the peak of the hunt. ‘Italy Guy’ wants to meet his next handbag while it’s still alive, and none too happy with that fate. A big nod needs to go to the narration by Pat Duke, which is brilliant. Far from being a passive voice, Duke tells a story and involves you in it. His deep, mellow voice is rich with local inflections and idioms, as natural a part of the aural landscape as the chirps of birds and frogs. Even as a total ‘Greenhorn,’ you come away from the experience feeling as if you’ve learned something- that you’ve been initiated into an inner circle of special knowledge and tradition. Questions about conservation and animal cruelty are left alone, so if those things make you squeamish you‘d best give Swamp People a miss. This is not a moral debate, just a fair and frank depiction of a way of life. There is a ton of bonus footage included here. A highlight is Jacob’s trip to the taxidermist, where he gets the head of the infamous ‘Loch Ness’ turned into a trophy mount. Also included are various interviews and anecdotes that didn’t make the final cut. A massive ‘gator is thrashing and snapping at the end of the line you’re gripping in one hand. He rolls furiously, churning the water, threatening to destabilise your boat and pull you in. While this is happening you have to aim your heavy rifle at the creature’s only weak area, a soft fleshy spot the size of a small coin. Swamp People puts you right in the thick of this kind of action. It’s adventure television done right. My stomach’s rumblin’ for some deep fried ‘gator, Cajun style.